Following a three day visit to Uganda, Managing Director of the International Monetary Fund (IMF) Christine Lagarde issued a statement commending the African nation on its commitments to improve the economy. In the statement, Lagarde praised Uganda’s efforts in reducing poverty and increasing the reliance of the private sector in spurring growth over the last 30 years, but also stressed the importance of all future growth to be “inclusive” in order to further reduce poverty levels. “I commend Uganda for its growth and poverty reduction achievements over the past three decades. These achievements have been underwritten by strong macroeconomic policies, and a reliance on the private sector as the engine of growth. Looking ahead, I welcome the government’s sense of urgency and emphasis on promoting inclusive growth which is needed to make further progress on poverty reduction and create jobs for the fast-growing population. In my discussions, I emphasized that lifting growth will also require complementary reforms that reduce income inequality and support gender equality. I commend the government’s achievements in financial inclusion, including the rapid growth of mobile banking. An assessment from the World Bank last year highlighted that the proportion of Uganda’s population living below the national poverty line fell from 31.1% in 2006 to 19.7% in 2013. 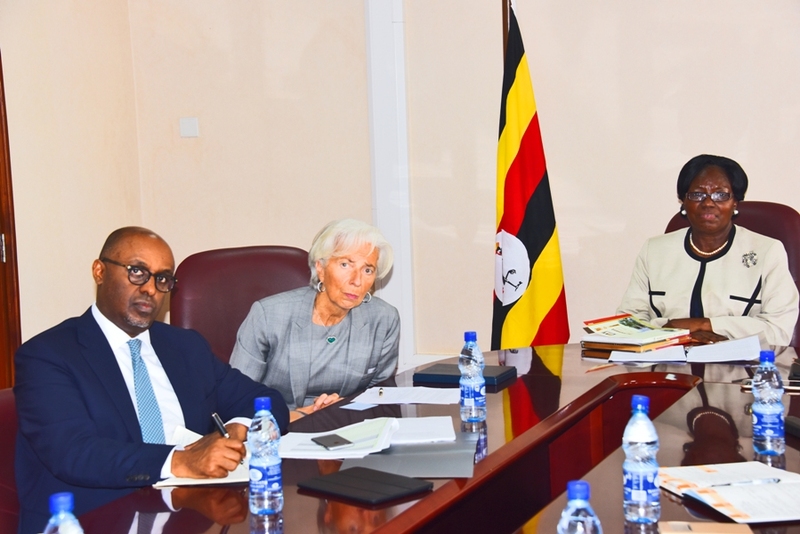 Lagarde also pointed out that the importance of Uganda’s importance within the East African Community (EAC) and hopes that deeper integration will happen over the next few years. Uganda is one of the few countries in the EAC waiting for two other East African nations to ratify a peach and security protocol. “Uganda is set to benefit from deeper economic integration within the East African Community and the advent of oil production in a few years. We agreed that strong institutions and a favorable business environment are essential for seizing these opportunities. Tackling the corruption in the country will further encourage exporting and sustainable use of oil. With the price of oil floating around the $50 mark recently (and other oil producing nations budgeting for a $50 oil environment), transparency will be an incredibly important factor in ensuring that the country’s commitments are viable. One of the major talking points was brought up later in the statement: Uganda’s approach to tackling and controlling government debt, as well as adhering to its inflation targeting framework. Uganda’s year-on-year inflation rate currently stands at 5.9% (January 2017) and has fluctuated around the 5% mark for the past 5 years, after reaching highs of almost 25% in 2012. The government debt-to-GDP ratio has increased over the last few years (31.07% in 2012 to 34.4% in 2015), but it has more than halved since 2004, where it reached highs of 85%. Lagarde concluded the statement by praising Uganda’s efforts to taking in refugees and allowing them access to public services while ensuring that they are integrated into the labour force.